My last post got me curious about my early knitting, so I dug around in some truly historical boxes and found several early FOs that produced significant eye-rolling. I think I knitted this doily when I was about ten years old. It was a project for Camp Fire Girls--I got a Craft Bead for it. (Camp Fire Girls gave out beads instead of the badges that Girl Scouts awarded.) I remember hating the entire project, which was knitted with DMC cotton (perhaps #70 on #0000 needles). Other ten-year-olds were playing jacks and jumping rope. Somehow, I ended up with this doily. What was Mother thinking? Following that, Mother had me knit a pillow case edging for my Hope Chest. For those who have never heard of these things, they were big cedar chests that girls were supposed to fill with handmade items in preparation for marriage. Mine was full of cross-stitched pillowcases made by my grandmother. I actually used one once and woke up with a cross-stitched rose pattern embedded in my cheek. This was the absolutely last pillowcase edging I ever made. I detested working with cotton (and still do). And, as I pointed out to my mother, lace edgings were a bit dated, even back then. 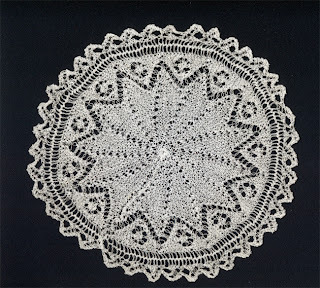 I made one more doily sometime in the 1970's. The pattern came from an old Burda lace pamphlet. As you can see, I don't think I ever blocked it. It was an unfortunate shade of ecru cotton and I can't think why I bothered with it. There's no date on it, but it has to have been published in the 1930's or early 1940's, because it was a gift from her mother before she was married. 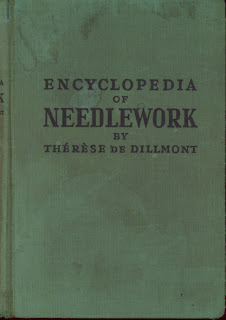 I used to pore over this book for hours--it contains instructions for the most delicate of laces--tatted, needle-made, bobbin, crocheted, knitted. I suspect that my early fascination with knitted lace came directly from this book, which, by the way, was reprinted often. Many editions can still be purchased via Amazon. The pages are a bit dated, but the illustrations are amazing, especially when you consider that they were all hand-drawn. My mother took lessons from Barbara Abbey when she worked at Alice Maynard Needlework in New York City. 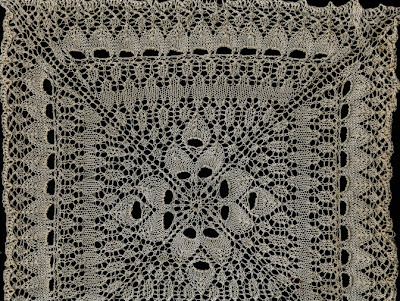 Barbara Abbey is most well-known for her classic book Barbara Abbey's Knitting Lace. I flipped through this book today and noticed that my pillowcase edging was a variation of her Double Rose Leaf edging. It's a very pretty pattern and could be easily scaled up and used to make a narrow scarf. Used editions of this book can also be found at Amazon. 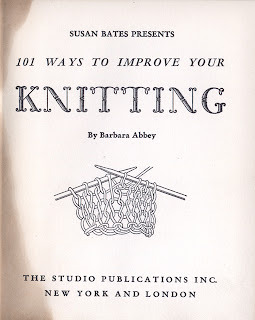 101 Ways to Improve Your Knitting was printed in 1949 and contains fascinating tidbits about Barbara, who learned to knit when she was 3 years old with two pencils and a piece of string. The intro to the book was written by Susan Bates (yes, she was a real person!). I hadn't opened the book for years until this morning, and was amused to note that she lists three kinds of Novelty yarns: Smooth Boucle (what the heck is Smooth Boucle? ), Nubby, and Crepe. Choices were a bit more limited back then. 2-ply, 4-ply, worsted. That was about it. Knitters had to be more inventive then, but frankly, I prefer the wide and deep range of choices that we have today. Let me know if you have a clue about smooth boucle, would you? Wow, what treasures you made back then! Of course, that lace was out in the 70s but it's cutting edge nowadays. The first book has been republished...maybe by Reader's Digest? I have the reprint of that, and a copy of the second book (my Grandmother gave it to me). They're both great! Hello, maybe I should read a post rather than skimming it before I talk, eh? Hi! Just jumped here from Knitter's Review forum - "Mountainash" is the key word. I'm currently on sick leave and don't have constant computer access, but as soon as I get a bit better, I'll post about the progress I've made with Mountainash. It's not much, but it is a beginning. Mountain Ash seems to be a popular buzzword. I gotta put together a KAl for this, at some point. I'll try to post a picture of it soon and see if I can get some other people interested. Your blog and your knitting are great. I adore historical craft books. I once had one out of the a long time ago - it may have been your needlework one. 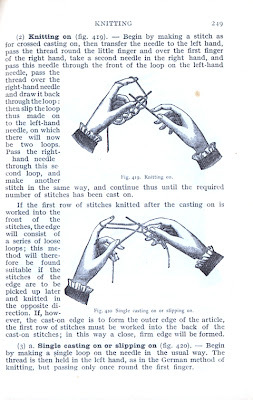 It had a tatting technique I had never seen before or since where you make a long picot, cut the loop and separate the threads to make a tiny tassel. Perhaps "smooth bauclye" is another way of saying slub yarn? I've just found Therese de Dillmont's book on Gutenberg, so I've downloaded it for my Kindle.